Email responses to my presale questions were prompt, friendly, and included suggestions that affected my purchase decisions ... and saved me money! The tips and supporting materials that arrived with the product were very helpful. 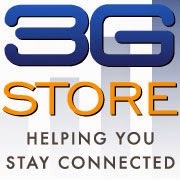 My complements to 3Gstore! It's great to see a business that does more than just ship boxes. You guys go the extra mile to make sure people get real value from the products they buy from you. Thanks Matt, we appreciate your comments and thanks for noticing how different we are.